In Part 1 of the series (here: https://codeandcodes.com/2015/10/04/search-engine-series-basic-ngram-indexing/), I described how to construct ngram indices for a body of text. We saw however, that ngram matching while quick, is imprecise because it matches too greedily. By parsing the query also into ngrams, we ended up getting matches that the user would not have been looking for. In this part II, I discuss how to achieve exact pattern matching. Relevance is more than a function of matching a query to a list of results. There is a psychological component. The gist of surfacing relevant data thus means returning results that are in the realm of expectations for a user. In other words, while a result set can be filtered in a technical sense to a set of results to return, it’s no good if a technical match is out the realm of expectation for the user. For example, using a simple weighting function like Levenshtein distance may yield a technically high scoring result, but if the minimal string transformations yield an unexpected result, the result is no good (e.g. “and” and “end”). We can minimize the effect by naively enforcing exact pattern matching. In part I, parsing the users query and piping it through the ngram map yielded an array of matching words to any ngram. We stripped the array of duplicates and returned the entire set to the user. However, we saw many false positives returned along with the good results. How do we eliminate those false positives? 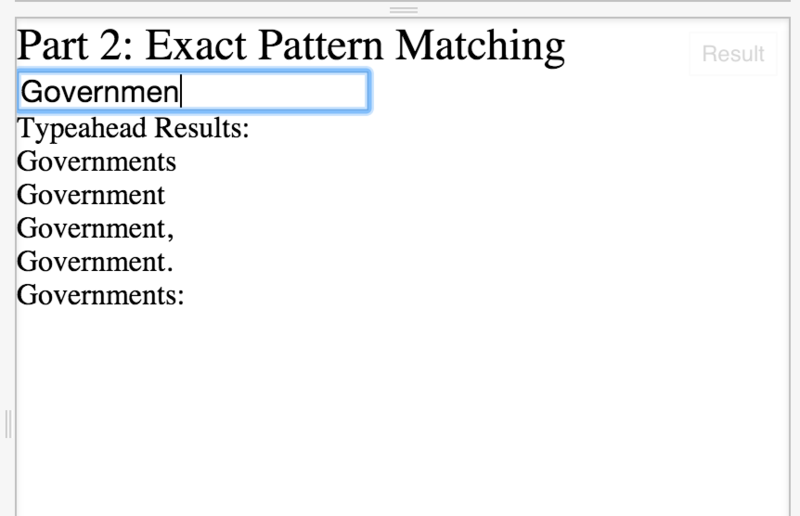 It turns out that achieving exact pattern matching is pretty simple and elegant. Each ngram array returned (e.g. for the query “governmen”) included an array of results that could be potential matches. In order to eliminate extraneous non-matches (like “fundamentally” or “settlement”) which match on “men”, we simply need to take the intersection of all result arrays. This yields a precise match against the string. Why does this work? Essentially, with our prior greedy approach, as we parsed the user’s query and filtered our hash, keying on each trigram that was created, we were left with an array of arrays of all potential matches. While this represented the complete set of matches, this also created situations where to qualify as a “result”, the word only needed to contain any trigram in the query. 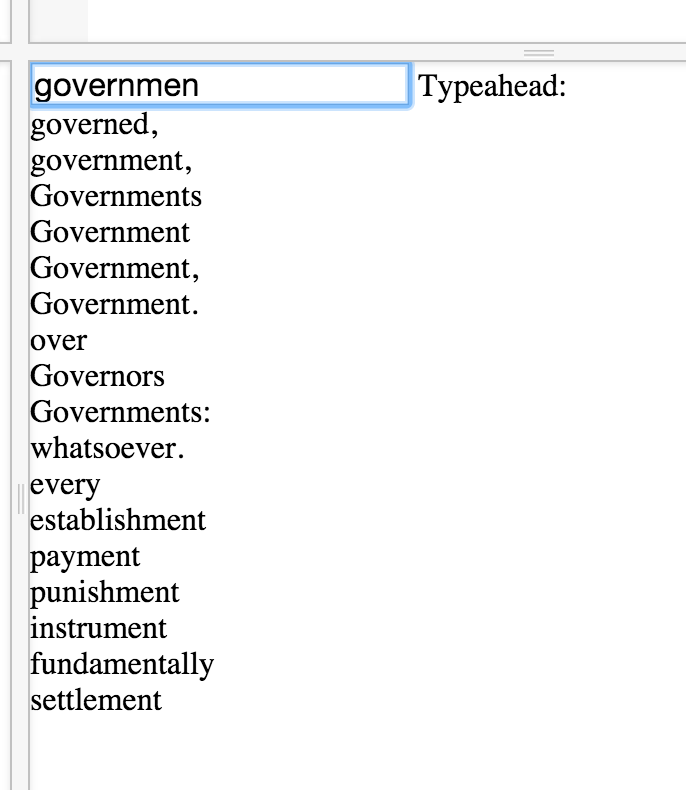 Thus, each word within our filtered results represented in a partial match of the user’s query. Ergo, to match a user’s query exactly, each word must match every ngram within the user’s query. How did we find the list of words matching all trigrams within the user’s query? Simple, just intersect the arrays. Usual disclaimer applies: Keeping it simple for the sake of explanation, could be refactored, yadda yadda yadda. Now we’re getting somewhere. However, our search is still incomplete. It’s not useful to simply return the word that matches the user’s query. We want to return some context (i.e. the words before and after) the exact pattern match so the user can determine whether the result is useful or not. We can also optimize our data structure for computeNGram. Right now we store only unique matches per ngram, which was OK when determining if there is an exact match. However, in order to store context, we can no longer quash duplicates. We can optimize performance as well in order to still provide fast matches in the above bullet. Stay tuned for part III. Perhaps I’ve been learning more and more that there’s no magic bullet to search. There’s several methods to indexing volumes of data, e.g. string tokenization, ngram tokenization; there’s levels of strictness of search, e.g. exact matches, fuzzy matches, partial matches; then there’s transformation of the search query itself, e.g. what indices to search, what parts of a query must be included in search results, fuzzyness matching and mispelling. In this next series of posts, I’ll be describing some search basics that may be useful to the reader. Disclaimer: In this example, I use a toy implementation and trigrams for the sake of simplicity. For the dictionary “corpus”, I use the Declaration of Independence. The code examples are meant to only illustrate the basic implementation details and aren’t meant for production use (however, the code will be refined over time). You can see that creation is simple: Essentially, you just pass in a word of length i, traverse through the word creating all substrings of length N, where N is the “N” in “NGram”. In this case, I’ve chosen to use trigrams, or NGrams of length 3. As the user types in his/her query, we break that query apart into ngrams as well, and match against our ngram map (i.e. the corpus of data). This gives us an array of arrays of matching words per query. Then we simply flatten the array, remove duplicates and present the results to the user. However, the astute reader will notice that matching ngrams to arrays of occurrences does not provide a useful search in itself whenever the query extends beyond the ngram length. How do we solve for this? The solution, it turns out is fairly simple. Stay tuned for the next post. Week 3, biglawrefuge. Just spitballing. Week 3, what have we learned? Biglawrefuge has been in existence now for three weeks. This has been the slowest week for growth so far, adding only around 100 users. The first week saw 250, the week after that another 300, then this week, the numbers have dropped back down to earth (for me). There’s a limited audience to which biglawrefuge appeals at the moment, which is fine. I just need to focus on making the product better while still getting the word out. If it’s good enough, users will continue to come. This is an interesting statistic, provided by google analytics. Biglawrefuge, though the numbers fluctuate drastically, sees on average about 1000 – 1500 page views a day and around 150 – 250 user sessions per day. However, I’ve closely monitored the returning user count and the number keeps going up. Maybe that’s because the number of new sessions is decreasing, or maybe it’s because the existing use base finds something of value on the site. In the past week, I’ve added the ability to find out your “contribution score.” Contribution score is essentially a metric that is based on the number of jobs, reviews, interviews, and articles you contribute, which is then weighted by the number of likes each contribution sees. It’s a quick and dirty estimate. No science went into coming up with the weighting function (except just seeing that the numbers clustered closely together and that taking small actions would have an impact on your score). The idea of a contribution or user score is common to many websites. I guess the rationale behind adding the feature is that users need to see a sense of change when they return to a website, a sense of progression, and a sense of reward. When they contribute more, users end up forming a closer attachment to the website (probably by some combination of the sunk cost effect and the desire to achieve some goal). I toyed around with the idea for a while, but finally implemented it. To be perfectly honest, I have no idea if it’s a good feature or not. However, I do have data relating to when users have contributed their data. Hopefully this provides some motivation. Likewise, I’ve also added the concept of achievements. 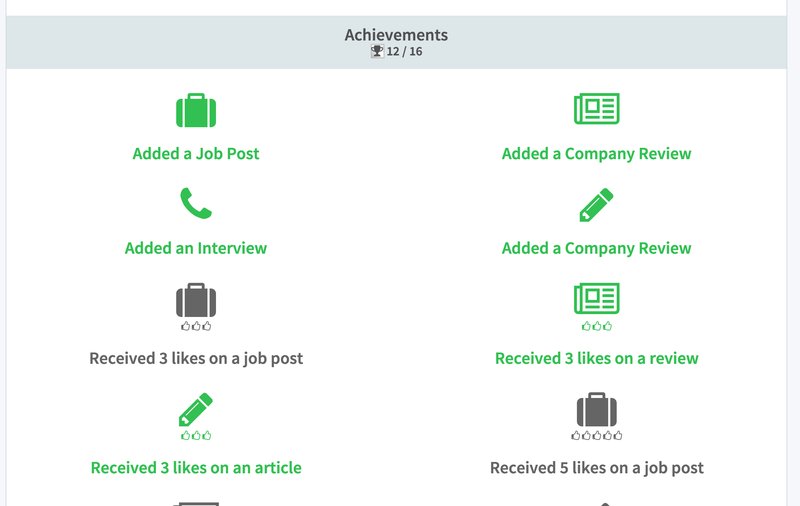 Achievements are really easy to get at the moment -they just consist of creating certain objects on the site, getting a certain number of likes on something you’ve contributed, and making comments and receiving comments. Achievements are closely related to one’s score, but they’re more discrete and represent tangible steps to complete. Now that I’m thinking of it, I should give a bonus to your score for each achievement. What’s nice about biglawrefuge is the fact that there are no real expectations at the present. It’s a website that has a moderate number of users. They tend to be loyal. They have been consistent. It’s my first experience outside of work dealing with real users and the issues that go hand in hand with launching a product into the wild. When I view it from that perspective, it makes it easier (mentally) to add in a new feature just to see if it works. One thing I’m trying to avoid at least for now: Don’t quell innovation in the effort to maintain and grow one’s user base. The bottom line is if I’m constantly worried about user growth, I’ll never take chances that could make the site great or teach me a valuable lesson. As for how things are going regarding biglawrefuge in general: To be frank, there have been mixed reactions so far. Along with the mix of anonymous critiques, there are the doubters, those who are quick to find fault, and those who lack confidence in biglawrefuge’s ability to turn into something. Even for well-meaning friends, it’s all too easy to hop on that bandwagon. That’s all right; I don’t blame them. Going it alone is really really hard, because by yourself, you have to build, market, define and defend the product. You have to establish the product vision, plans on how you scale it, plans on how to define when you’ve succeeded. These are all things that companies founded by two or three co-founders have the luxury of handing-off to one person to focus on. However, one article I read recently on hacker news provided some much needed encouragement: http://dontscale.com/stop-looking-for-a-cofounder/. The article basically describes the nature of solo entrepreneurship and its pitfalls, but also describes the status quo as being better today. PaaS like heroku really bring scalability to the masses. I love this article. Maybe it’s just telling me what I want to hear, but it’s also a reminder that you don’t always need a team to succeed. Drive and passion can take someone a long way, and can be that source of constant motivation even when there isn’t a reciprocal response. Let’s get it done. Week 2 of biglawrefuge, what have we learned? Description: I’ve tried emailing various online content providers like Abovethelaw, the National Law Journal, the WSJ Law Blog, and other legal bloggers. So far, I’ve heard a “we’ll get back to you if we’re interested” from ATL, nothing from the NLJ or WSJ, and only one response from a legal blogger. Not sure how to really grab their attention. Maybe biglawrefuge needs to have more traffic before it’s worth of national attention. Description: I started off by announcing biglawrefuge to TLS. So far the community has been awesome. Super supportive (mostly) and I’ve gotten both great feedback and really positive responses. In many ways, that community represents the community that I’m directly marketing to. The nature of biglaw hiring is that biglaw firms take disproportionately from the top law schools and the biggest confluence of students from that background gather on TLS. Jdunderground is a MUCH smaller community. Using google analytics as a guide, TLS drives 100x more traffic. Description: Every time I have something worth sharing, I’ve posted it to http://www.reddit.com/r/lawschool. So far, I’ve made three self-referencing posts, which some users have not been too happy about. Not sure why it’s that big of a deal, they’re not duplicative in any sense (except maybe by having the articles hosted on the same webpage). In any case, the reddit community is large and the fact that everyone sees what’s on the frontpage makes it in many ways more effective than TLS. The last two times I’ve posted an article, my average views has tripled or quadrupled. Facebook on the other hand has been disappointing. Most likely my friends are tired of hearing about biglawrefuge, so there aren’t many clicks driven by that. Twitter has been useless, but that’s mainly because I have so few followers. Description: Each week so far, I’ve sent an email to all the users who are signed up for biglawrefuge. 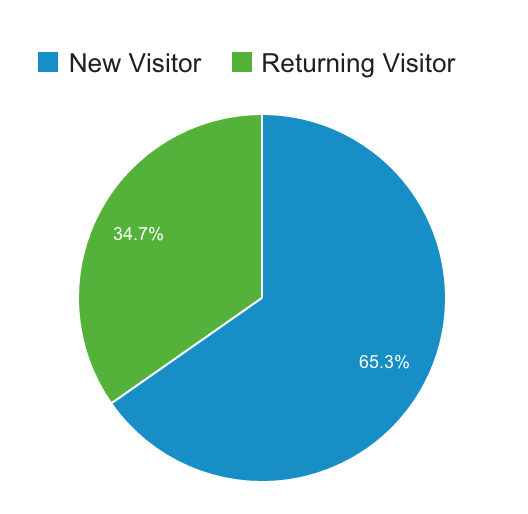 And as I send the email, I watch google analytics to see how many users get on the site. It definitely brings people back. I’ve heard from others that email campaigns are the way to go, but it seems like a fundamental problem with emailing users is getting the users first. I understand that it’s a way to keep the momentum going, but obviously it doesn’t help to get the ball rolling. When I post them to reddit or TLS, it ends up generating an enormous (for me) amount of traffic. I know the articles are popular. There’s the occasional bad comment here and there, but by and large people have all stated that they really like the content. I think part of the reason for this reaction is my approach to writing the articles. I’ve been 100% transparent when writing them, not hiding the ball, even at risk of my own reputation being tarnished. That doesn’t matter. I want to bring greater transparency to the legal profession, so what better way to do so than to lead by example? Despite having close to 600 users now, probably 3-400 of whom are going through OCI, there have only been 159 job postings. I don’t know why law students are so secretive about this information. I guarantee that extremely few people care one way or another. So despite the thousands of views to the job postings and law firm reviews, law students are reluctant to contribute themselves. I may eventually introduce some gating in the future to encourage more contribution, but won’t do that at first. Cmon people, contribute! I built this website for you. It’s a constant battle to market the website. I feel like my welcome is already wearing thin at TLS and reddit/r/lawschool. Not sure what other channels there are besides direct contacting of various law schools career services offices. And that’s an uncertainty, because I don’t know what the reception will be like. The days I publish articles, traffic jumps sharply, but of course, it’s just a temporary spike. Quickly after, the traffic mostly goes back to normal. Hopefully, by the time I run out of content, the community will mostly be self-supported. I’ve been completely honest to the communities I’ve posted to. I don’t plan on hiding the ball from them or suddenly changing what I’m doing. I’ve been honest about the struggles of running biglawrefuge myself, with dealing with unfriendly folks, and with getting users to contribute. Thank you ALL for those who have reached out to me to encourage me in the process. It means a ton and it motivates me to continue writing and bettering biglawrefuge for you guys.